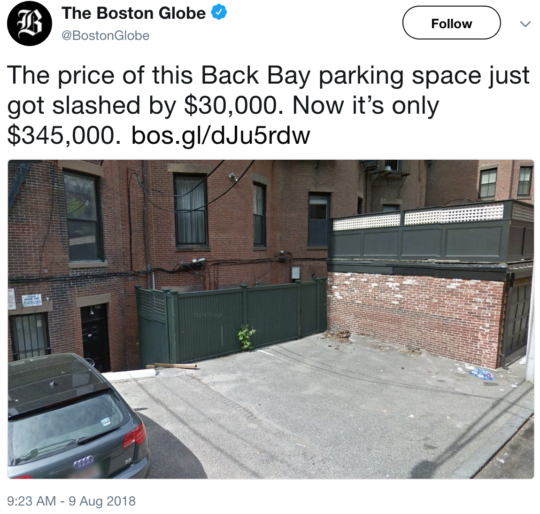 Boston’s pricey parking lot… China’s bargain gold buys… more reader reactions to the Alex Jones ban hammer… and more! Back in June, we warned a day like today was coming. We also said it wasn’t necessarily the end of the world — or the nine-year bull market. A crisis in an emerging-market nation, rumbling away for months, is suddenly having spillover effects in the rest of the world. 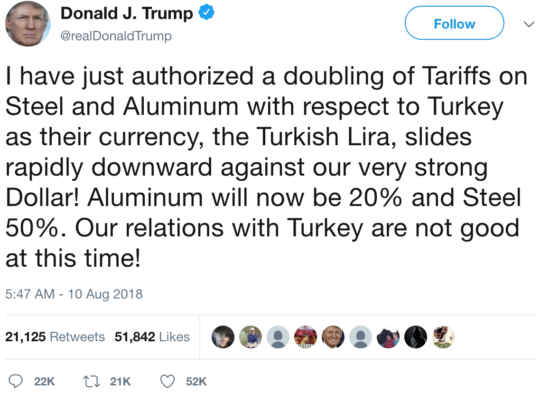 The crisis is in the Turkish lira. 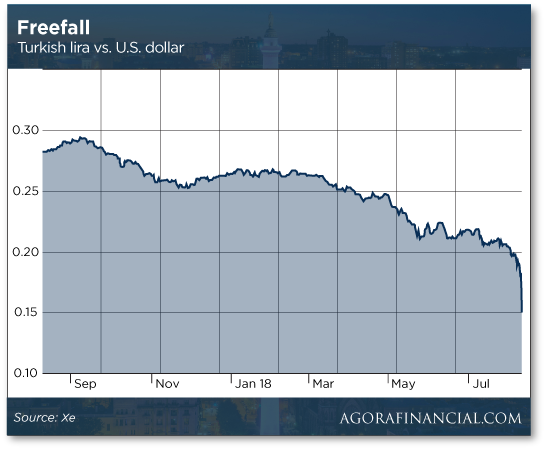 As of yesterday it was down 31.5% against the dollar year to date. It’s down another 20% just this morning, plumbing all-time lows…. Within the last 24 hours, the contagion spread from Turkey to several European banks. The Financial Times reported the European Central Bank is looking into the Turkish exposure of major banks like Spain’s BBVA, Italy’s UniCredit and France’s BNP Paribas. All three of them ended the trading day down big — BBVA nearly 6%. From there, the contagion spread into European stocks as a whole, and then most other global markets. Despite that dollar strength, gold is hanging tough at $1,215. He’s right about those bad relations — Turkey’s status as a NATO ally notwithstanding. Last week, Washington imposed sanctions on two members of Turkey’s Cabinet — retribution for the ongoing detention of an American pastor named Andrew Brunson. He’s accused of involvement in the failed 2016 coup against Turkey’s President Recep Tayyip Erdoğan. 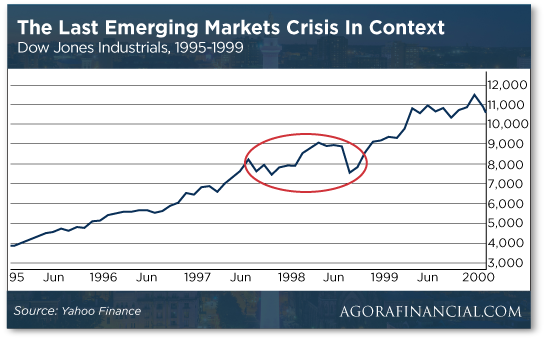 As Jim Rickards reminded us a few weeks ago, emerging-market crises creep up every 15–20 years. We’re just about 20 years beyond the crisis that began in the “Asian Tiger” economies in the summer of 1997 and ended with Russia’s default and the collapse of the Long Term Capital Management hedge fund in August–September 1998. There were steep sell-offs in U.S. stocks along the way — much steeper than today. The Dow sold off 7.2% one day in October 1997 and 6.4% one day in August 1998. By the time the crisis was over, the Dow sat at the same level it did when it began. But no one remembers that now because when it was over, the dot-com boom resumed and ultimately went supernova. Oh, here’s a wild card in the whole Turkey thing. This could get ugly. As you might know, the United States maintains a huge air base in Turkey called Incirlik. Washington has used Incirlik for “power projection” into the Middle East since the mid-1950s. This week, a group of Turkish lawyers allied with the Erdoğan regime filed charges against several U.S. Air Force officers stationed at Incirlik — accusing them of involvement in the 2016 coup. They’re demanding the Turkish government halt all flights out of Incirlik to keep the officers from fleeing the country. And they’re demanding the government raid the base and arrest the officers. Yeah, that could get really interesting. The Air Force is downplaying the news. “We continue to carry out our mission here at Incirlik Air Base, and we are proud of the relationship we have with our Turkish military partners,” says a spokeswoman. But even if nothing comes of this, how long will Turkey continue to allow the Air Force to stay there? Serving members of Congress can sit on corporate boards? Who knew? Perhaps you saw the news that on Wednesday, the feds indicted Rep. Chris Collins (R-New York) for insider trading. “The congressman was arrested earlier in the day on charges that he shared nonpublic information with family and friends related to Australian biotech company Innate Immunotherapeutics,” says a CNBC story. Prosecutors say he called his son with news of a failed drug trial and the son and others sold the company’s shares before the trial results were made public. Collins knew of the failed trial… because he’s a member of the company’s board. Which sounds shady enough. But as it happens, he belonged to a House subcommittee that — according to Wikipedia — has oversight of “biomedical research and development,” among other things. Conflict of interest much? “Members of Congress are not prohibited from serving on corporate boards as long as they don’t receive any compensation for doing so,” says an Associated Press story. Even the Public Citizen watchdog group, founded by Ralph Nader nearly 50 years ago, was taken aback. “My own office was stunned,” says the group’s Craig Holman. We’re not sure who else in Congress serves on a corporate board, but already a bipartisan effort is underway to change House rules and forbid the practice. [Ed. note: Have you started collecting “Congressional Checks” yet? Some of our readers have been collecting fat payouts the last few weeks, very much like the ones collected by members of Congress. Better yet, these checks can come your way on a regular basis… and the sizes of the payouts typically grow each year. One of them just jumped 40%, says our income specialist Zach Scheidt. Inflation continues to accelerate, even going by the scammy official numbers. The Bureau of Labor Statistics issued the July consumer price report this morning. It registered a 0.2% increase for the month. Rising housing costs were far and away the major driver. That means official inflation is now running at a 2.9% annual clip — the fastest since early 2012. At that rate, another Federal Reserve interest rate increase next month is a sure thing. As always, we caution any resemblance to your own cost of living is purely coincidental. Shadow Government Statistics — which runs the numbers the way the feds did 40 years ago — reckons the real-world inflation rate is 10.8% — the highest since late 2011. Speaking of housing and inflation… who says ridiculous real estate prices are just a Silicon Valley-Bay Area thing? The Route 128 corridor surrounding Boston is a high-tech hub in its own right. Biotech too. It has benefited from the Fed’s shower of easy money since the Panic of 2008 nearly as much as Silicon Valley, Wall Street and (of course) the District of Columbia. The parking space depicted here is located behind 195 Beacon St. in Boston’s Back Bay neighborhood. It’s “a full space that’s easy to get in and out of,” enthuses Lili Banani of Coldwell Banker. And the price has just been “slashed” from $375,000 to $345,000. If it sells now, it might set a record, but not by much: The Boston Globe says a spot at 48 Commonwealth Ave. sold for $300,000… in 2009, only months after the 2008 crisis! “Another interesting episode. Thank you,” a reader writes after we went in-depth about gold yesterday. “I keep wondering every time I read how many tons of gold China, Russia, Iran, etc., continue to purchase each year, why does the price of gold continue to fall? The 5: Nothing we haven’t covered before. We addressed this question in the course of tackling several related questions a couple of years ago. “Thank you so much for your frank exposé Wednesday!” a reader writes after our 5-ish take on the “deplatforming” of Alex Jones. “I’ve been watching and thinking about the very moves and controls you mention that are possible with a marriage of the deep state capabilities with voluntary surveillance from Facebook,” writes one of our longtimers. “Anyone who believes Cambridge Analytica was a one-off event, or that it won’t or hasn’t happened again, is a fool of monumental proportions! “I am usually on the bleeding edge of technology. “I’m not a Luddite by a long shot. Technology is neither good nor bad. It simply reflects the good or bad in how governments/businesses use it. “You can see why this remains a long-term concern, especially since so many people do it willingly. “Jefferson wrote about the need for a well-informed citizenry to keep its government in check when it sees it going astray. “You’ve seen all the ‘person on the street’ interviews where people can’t name the three branches of government as outlined in the Constitution. Hell, they can’t even figure out to take a gold coin versus a candy bar. We fought for our independence against Japan, etc. “How else can you explain people keeping their FB accounts in light of Cambridge Analytica? “In the case of Alex Jones, I say put a barking dog down. When you spread hate, not something constructive, then you should be censored. PERIOD! “That’s my opinion because with this newfound attitude, the say what I feel, let it all hang out demeanor is counterproductive as to what this country truly needs right now.